The venue has been fitted with digital signage-based flexible branding systems to display animated content. The flexible branding system features six optical front-projection Supernova screens, positioned above the main reception and seamlessly connected to create an image span of over 9m. Scala’s InfoChannel software suite was specified to streamline the management and broadcast of content and provide playback. The installation enables Manchester Central to offer advertisers and exhibitors a variety of branding packages, using digital animated content to secure the attention of visitors and delegates. Content can also be displayed to complement current events or promote Manchester Central’s own facilities. 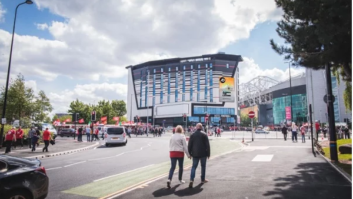 “The integrated Supernova screens create a high-impact display area on which full animated audiovisual content can be broadcast, so that Manchester Central can easily control what content is displayed and when,” said Nikk Smith, technical director at Pixel Inspiration.